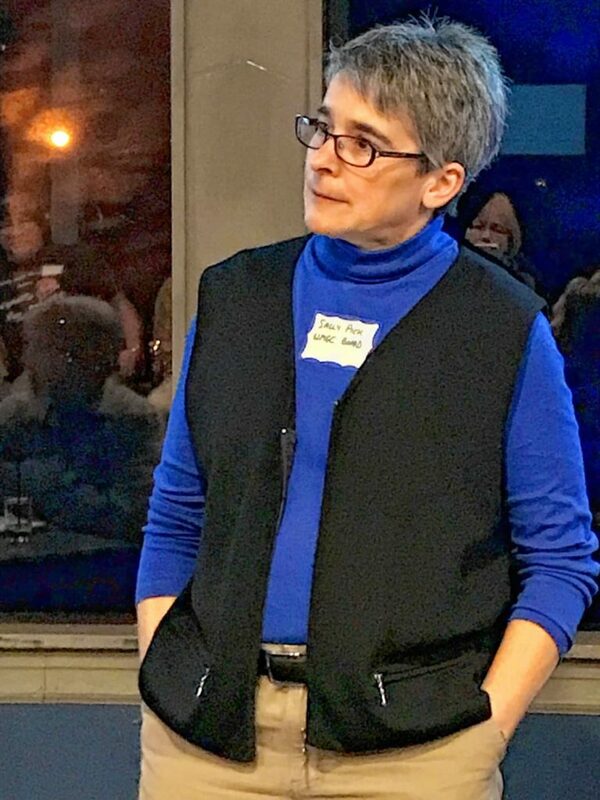 Sally Pick of SJP Consulting, LLC explains the latest information about electric vehicles to participants in the Western Mass. Green Consortium's Nov. 14 Green Night. The Western Mass. 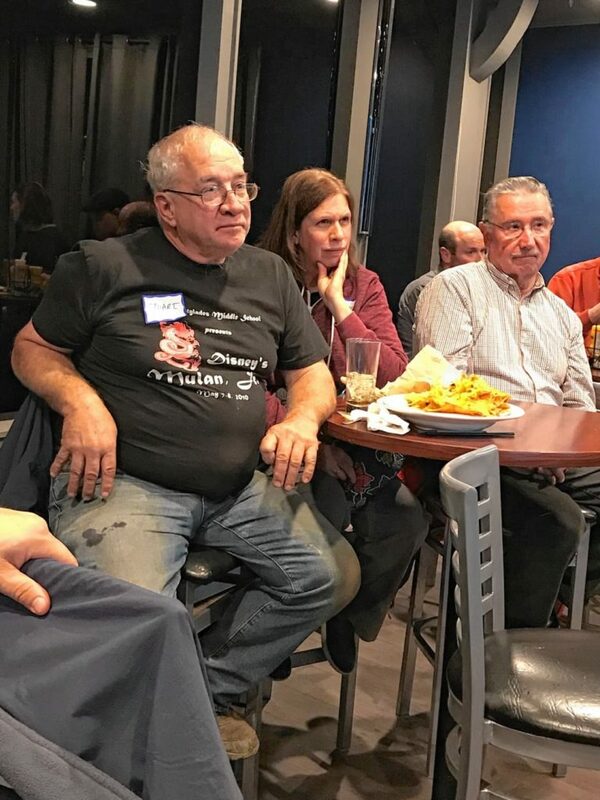 Green Consortium's Green Nights are free, environmentally-focused presentations held on the second Wednesday of every mongh from 5:30 to 7 p.m., at the Platform Sports Bar and Grill in Northampton. Young woman is standing near the electric car and holding smartphone. The rental car is charging at the charging station for electric vehicles. Car sharing. Electric cars are becoming more popular as technology advances and the world grows increasingly concerned about greenhouse gasses from fossil fuels. Despite their environmental concerns, however, people often express one of two hesitations about electric vehicles. 1) They’re afraid their battery will drain and leave them stranded. 2) They’re afraid all electric vehicles are high-priced, like the $75,000 Tesla Model S.
First, let’s look at the dead battery scenario. Most of today’s all-electric vehicles have at least a 100-mile range; many have twice that. This means a local electric vehicle (EV) driver can travel the 98 miles from Greenfield to Boston without stopping. Plug-in hybrids, which run on gas and battery, boast an impressive range of up to 640 miles. Therefore, that same, local driver could climb behind the wheel of a Prius Prime in Greenfield and never have to refill or recharge until the far side of Richmond, Va. According to Pick, “There are roughly 1,400 charging outlets in Massachusetts and there are more in the works.” Furthermore, she said, there are cell phone apps that pinpoint the closest charging stations with a few simple taps. Some of Pick’s favorite apps are ChargePoint, PlugShare, and EVgo, resources she uses while on the road in her Chevy plug-in. Many drivers have already overcome the fear of EV power failure. Right now, Pick said, there are approximately 15,000 EVs in Massachusetts (compared to 300,000 in California, and a whopping 600,000 sold in China last year alone). They’re no longer a novelty — and neither are places to charge them. Many local municipalities, including Greenfield, Northampton and West Springfield, host free charging stations. Other communities, such as Amherst, require a small, per-minute fee. Most Massachusetts transit stations have charging ports, and there are multiple places to stop and recharge along the Mass Pike. Second, Pick shared some encouraging news about affordability. The incentives Pick described are pretty chunky, too. In fact, they could potentially trim $10,000 off the sticker price. “There are currently 42 vehicles that qualify for the EV rebate in Massachusetts; I’m not going to cover all of them,” Pick said, smiling. “The Massachusetts rebates range from $1,000 to $2,500, depending on the size of the battery. You have to use it the year you buy the car.” For a current, detailed listing of Bay State electric and hybrid vehicle rebates, Pick recommends visiting the Massachusetts Department of Energy Resources’ website, mor-ev.org. Pick also highlighted the “Drive Green” program designed by the Green Energy Consumers Alliance, a nonprofit, environmental organization that works with car dealers to offer special incentives for consumers looking to purchase low- or no-gasoline cars. 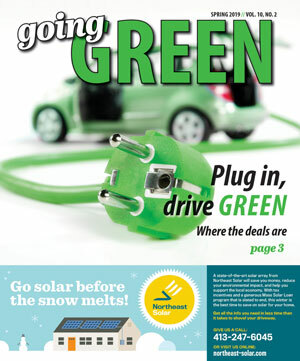 The deals change month to month, but, by going to greenenergyconsumers.org/drivegreen and signing up for the Drive Green program, drivers can become emissions-free (or low emissions, if choosing a hybrid) at a sweet price. Pick said federal tax credits range from $2,500 to $7,500, again depending on the size of the car’s battery. She warned would-be buyers to beware, however, because federal incentives phase out for each automaker after they have sold 200,000 electric cars. Pick said Tesla has already reached that cap, and Chevy was expected to reach it by the end of 2018. Massachusetts and Drive Green discounts apply to purchased and leased vehicles, Pick said. Federal tax credits, however, apply only to purchased vehicles. Pick added that driving and maintaining an EV or plug-in hybrid is more cost-effective than current fossil fuel burners. “The average electric vehicle saves $2,100 in maintenance compared to a similar sized gas-powered car driven 150,000 miles,” Pick said. EVs require little regular maintenance, they have fewer fluids to change, the brakes last longer due to regenerative braking, and EVs have fewer moving parts to warrant repair. Additionally, lower fuel costs increase savings. A gas-powered Honda Civic gets 34 MPG, whereas that all-electric Nissan Leaf gets 112 MPG. “If you have home or community electric you can access, you can save most or all of your electric costs charging your vehicle,” Pick said. If you have home solar cutting your electric bills, all the better. Pick did note that new EV drivers will need to install a home charging outlet. Although it’s possible to charge an electric vehicle the same way you charge your cell phone — by plugging it into a standard wall outlet — it would take a very long time. The average charger installation fee runs about $500, but older homes with 100 amp service will need an electric upgrade, which could easily double the expense. Finally, Pick called attention to ways EV drivers can charge their vehicles as cleanly as possible. “For the lowest greenhouse gas emissions, you want to avoid charging during peak demand. That’s when the utilities use the dirtiest fossil fuels, like oil and coal,” she said, noting that higher peak demand helps to justify pipelines. One way to get your EV to charge at off-peak hours, Pick said, is to program the charge for a 3:30 a.m. departure. Out on the road, EV drivers can participate in what Pick called “hypermiling” — stretching the limits of each charge. For gold medal results, coast down hills or into stops. Use your seat warmer instead of cabin heat when reasonable. Remove ice and snow from the car to limit drag. Keep tires fully inflated. And, heck — be a rebel. Go ahead and take the slow road for once. 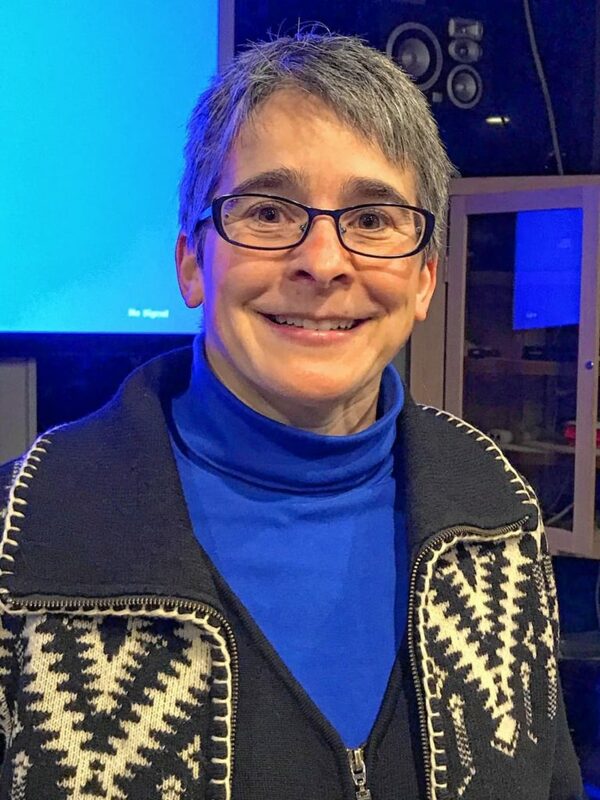 The Western Mass Green Consortium’s “Green Nights” are free, environmentally focused presentations held on the second Wednesday of every month from 5:30 to 7 p.m. at the Platform Sports Bar and Grill at 125A Pleasant St., in Northampton.